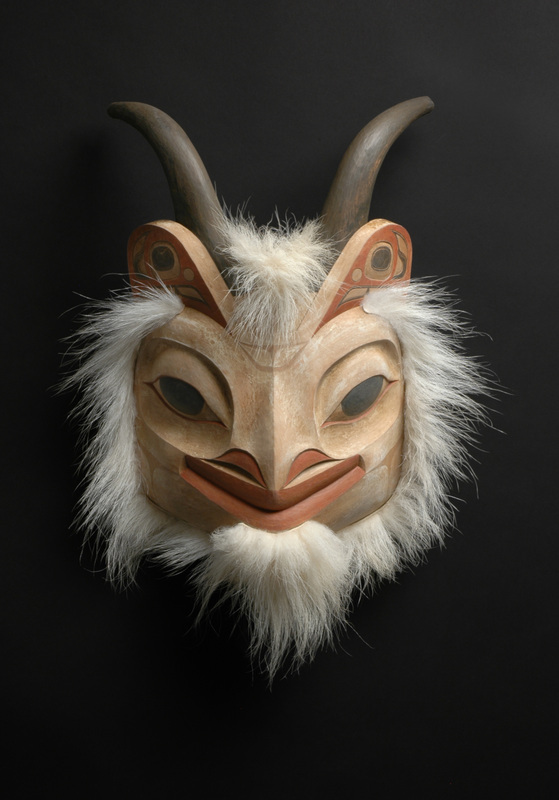 Mountain Goat Mask 10" x 17" x 6"
To get on our mailing list for classes and other information fill in the boxes below. My heritage is Danish. My great grandfather Soren Jensen and my great grandmother Karen Jensen (née Hansen) came to Canada from Copenhagen, Denmark. My grandfather Michael Jensen and his wife Grace lived in Waddena, Saskatchewan where my father Maurice was born. The family moved to Vancouver, Canada and eventually immigrated to the U.S. I grew up in Bellingham, Washington, where my wife and I still live. After having quit school early and working at many different jobs over a ten year period, I decided to look for something more meaningful to do. I wanted it to be something creative but I didn't know what that was. This was in the late 1960's and there were many little shops and craft fairs in the area, so I set about trying to make art I could sell. Some of the early efforts were painted posters, hanging tables (don't ask,) and a variety of other things too numerous to list here. Then one day out of the blue I thought, "I'm going to try to carve totem poles." That was 1972 and although I am not native it was the beginning of a lifelong journey that you can see the results of on this site. The first twenty years I worked on my own to learn about the art and culture of Northwest Native people. During that time I was asked to teach carving and tool making to the high school kids in Craig, Alaska; that was the beginning of my teaching. Since then I have given carving classes on reservations and reserves in Washington State and British Columbia, Canada, as well as the Olympic Park Institute and North Cascades Institute. Over the years I also traveled aboard the M. V. Snow Goose; we offered on-board carving projects and visited many towns and village sites all over Southeast Alaska from Ketchikan to Glacier Bay. I am now working with Bluewater Adventures out of Vancouver B. C., offering trips occasionally--and of course you can sign up for studio classes on this site. In 2010 Courtney and I had a dual ceremony of our wedding and our naming and adoption by our Tlingit brother and sister, Fred Sał kaa and Ivy Gunalshowaxeex Fulmer. Me into the Chookaneidí Eagle, Brown Bear and Porpoise Clan and Courtney into the T'akdeintaan Raven, Frog and Black Legged Kittiwake clan. 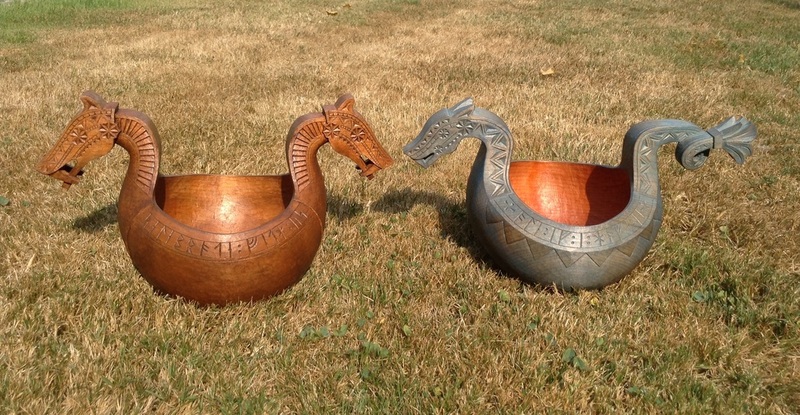 In recognition of my family I made these two ale bowls (kjenge), the blue dragon for my wife and the other for myself. Mine represents horse heads clad in dragon armor. 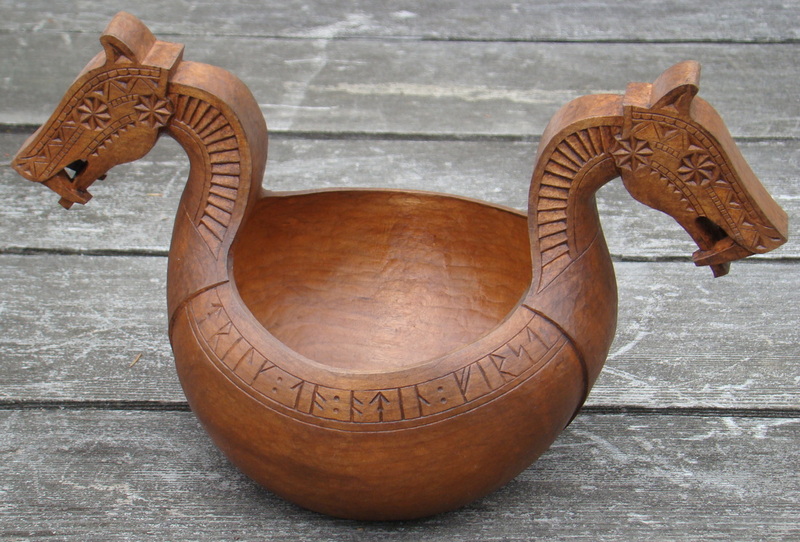 Bowls similar to these have been used in many Northern European countries including Denmark for centuries. One of the earliest bowls I know of dates from 1290 AD. The method of decoration on the bowls is called chip carving and the inscriptions are in Danish runes used from circa 1300 AD, when the runes were adjusted to the Roman alphabet. On the side pictured below is an old traditional toast, "Drink to Odin First", and on the other side, "Celebrate With Us". The inscription on the blue dragon bowl is a passage from Ælfric's Colloquy, when a novice is asked what he drinks he replies, "Ale if I have it, Water if I have no ale". 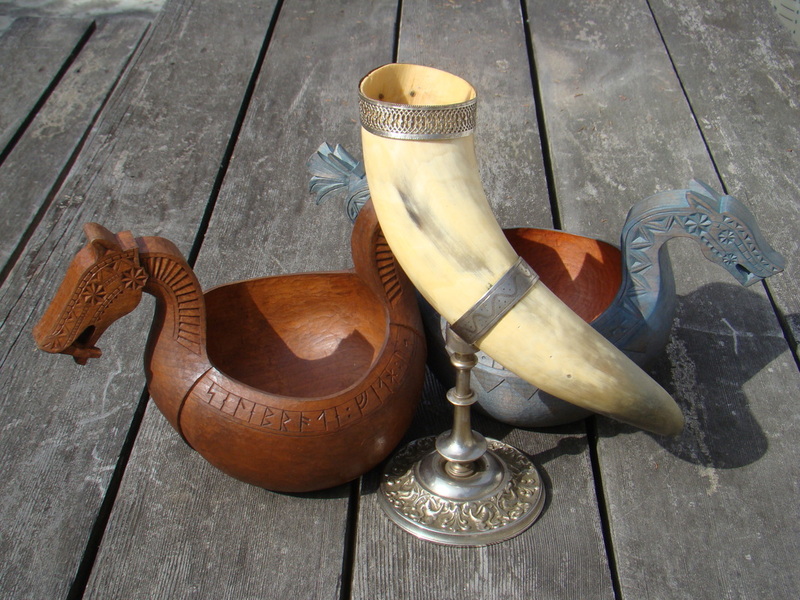 The drinking horn shown here with the ale bowls was made in Denmark by my great, great grandfather Nelse Hansen in 1848. It was inherited by my great grandmother Karen, and then passed down to her son Michael (my grandfather) in 1940. When he passed away it was given to me. Below is an ale bowl in a MUSEUM with an inscription written in old German, horse heads are carved on both ends.